The Health eDecision Project hopes to establish a standard format for CDS interventions to make it easier for EHR vendors to build the technology into their systems. The Office of the National Coordinator (ONC) for Health Information Technology defines clinical decision support (CDS) as providing “clinicians, staff, patients or other individuals with knowledge and person-specific information, intelligently filtered or presented at appropriate times, to enhance health and health care.” While CDS can be paper based, as in the case of paper order sets and documentation forms, the process is becoming increasingly electronic. CDS has been lauded by some as a game changer, a key component of the burgeoning HIT scene. “Stage 1 of meaningful use imposed requirements for computerized physician order entry [CPOE] on healthcare institutions. CPOE can be inefficient, so to increase efficiency and adoption, hospitals created order sets and built them into their CPOE systems,” says Stephen Claypool, MD, vice president of clinical development and informatics at Wolters Kluwer Health/ProVation Medical and a member of the Health eDecisions Project. One of the larger difficulties with implementing CDS within EHR systems, Claypool says, is that it requires facilities to employ bioinformaticists, clinical and technical experts who help build, implement, and share CDS across an organization. Most healthcare facilities do not have the expertise to decide which CDS to implement, create and maintain the clinical content behind the technology, understand how to utilize it effectively in clinician workflow, and technically implement the system. This challenge is further complicated by the fact that each EHR system has different mechanisms for implementing CDS because there are no widely adopted standards. Establishing such standards would make it easier for facilities to purchase, share, and implement CDS, Claypool notes. To make CDS interventions more timely as well as readily capable of sharing, implementing, and using, the Health eDecision Project, a collaborative working group composed of clinicians, academics, and vendors and supported by the Standards & Interoperability Framework, is developing standards so that such interventions are available either via the Web or CDS systems. The project aims to identify, establish, and coordinate standards that facilitate systems and services to allow CDS interventions to be implemented and shared. Its target outcomes include alignment with meaningful use, the creation of catalogues and repositories, direct interaction between CDS and EHR technology, widespread adoption and use, and the development of additional CDS interventions. Though CDS interventions are a meaningful use requirement, small providers do not have the resources to do their own informatics. As a result, they could benefit from examples supplied by those organizations with the wherewithal to do so. 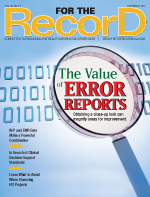 Additionally, EHR vendors are reluctant to move forward to support shareable CDS if there are no standards to follow. Such a process also would benefit clinical colleges, healthcare professionals, and other quality-focused organizations that generate CDS items. For example, the American College of Cardiology, which produces clinical knowledge and guidelines, could store its information in a CDS cloud- or Web-based repository for later use by physicians, nurses, pharmacists, and informaticists. Doug Fridsma, MD, chief science officer and director of the office of science and technology at the ONC, describes the Health eDecision Project as a continuation of the work that has been part of the ONC for several years, including that of the CDS National Roadmap project. This latest effort builds on those blueprints to determine the next steps, with approximately 200 individuals taking part, more than 70 of whom participate in weekly teleconferences. Fridsma says the Health eDecision Project team operates under two guiding principles: to go beyond a one-size-fits-all solution so that users and vendors will have numerous tools and to harbor no expectations that it will resolve every issue. Claypool believes one of the project’s largest hurdles is gaining consensus among its members on what the standards should be. What’s more, once the project succeeds in establishing standards, there will remain several “real-world” barriers that impact hospital efforts to integrate CDS into their systems and clinical workflows. However, creating and agreeing on standards won’t necessarily solve everything. “Even if there is a standard in place, decision makers still have to choose which CDS to use based on what works in each facility,” Claypool notes. CDS is a sophisticated component of HIT, one that requires computable biomedical knowledge, person-specific data, and a reasoning mechanism that combines knowledge and data to generate and present helpful information to clinicians as care is being delivered. The information must be filtered, organized, and presented in a way that supports a facility’s current workflow, allowing the user to make an informed decision quickly and take action. Fridsma maintains that HIT designed to improve clinical decision making is particularly attractive for its ability to address the growing information overload clinicians face and provide a platform for integrating evidence-based knowledge into care delivery. Although the majority of CDS applications operate as components of comprehensive EHR systems, stand-alone CDS systems are also in place.